We are a Peruvian Family Company, we want to contribute to ecotourism, which is the underpinning ecotourism in Puerto Maldonado. Because many people believe that only by logging or gold panning in the river, you can move forward, we work to conserve forests and changing the idea that many people have, so to continue this great change come and do the tour with us and together we can make the big change. Our team group of ecological guides completed their studies guide in the jungle of Puerto Maldonado and have been leading in the jungle for 10 years, one of our guides led the project oropendola of the BBC film "Fruiting Trees" in Manu National Park. We offer tour packages, with the best tours and great prices. because we are a locals company and our travel services are direct and personalized, for these reasons we invite you to travel with us and you contribute to the conservation of this wonderful jungle. and it is waiting for you !. 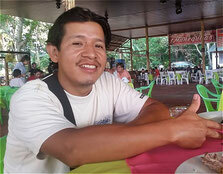 Abed Mancilla Muchari "Manager and tour guide"
I am a Peruvian tour guide and entrepreneur, who is the head of this company. We have 2 lodges, one on the River Madre de Dios, and the second in the Tambopata National Reserve "Lake Sandoval" because we want to contribute to the eco tourism, which is one of the tourist activities supporting ecotourism in Puerto Maldonado. You can continue helping us with your visit, as much of our forest is being lost because many people believe that only by cutting down trees or panning for gold in the river can get money, we want to work to conserve the forest and change the think that many people have. 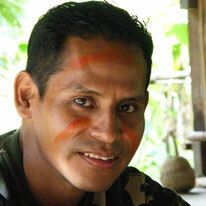 So to continue this great change, come with us and visit the Amazon jungle. KARIN MURGA MOROCO "Secretary and receptionist"
I am a native of Puerto Maldonado, I am a secretary and receptionist, working in our company, I am part of business team. 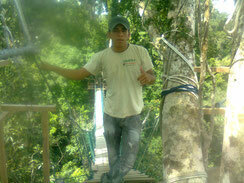 our goal is to promote the forest and so to contribute to sustainable tourism in Puerto Maldonado. BORIS GUERRA PACHERRES "Tour Guide"
I am 22 years and iam one of the younger and cheerful guides to this company, I am happy to work here because we have a very good working environment, policies of this company is not carrying more than 10 persons per guide and that this very well, and is best if you want to see more things in the jungle. 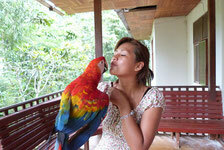 so do not waste anymore time come and enjoy with us this fascinating Amazon jungle.